The Macally HiFiTune may not be the prettiest earphones, but slip them in and put on your favourite song, and you'll soon forget the aesthetics. The deep bass that is combined with reasonable treble tones make it feel as though you are using a pair of over-ear cups. It's a shame then, that the HiFiTune's main purpose – as a headset for the iPhone – is let down by its mediocre call quality. Folks on the other end of the line commented that our voices sounded harsh and distorted, even though the in-wire mic hangs quite low in the wire (a problem in itself as it means you can't tuck the cable inside your coat without covering the mic). The mic unit includes a clicker button to pick up and end calls, and it also controls the iPhone's iPod, by clicking a number of times. This also works on the latest unibody MacBooks and MacBook Pros, so you can use this headset to control iTunes, and the microphone for Skype calls. The clicker unit is small, but its cylindrical shape makes it roll between your fingers as you try to find the button. 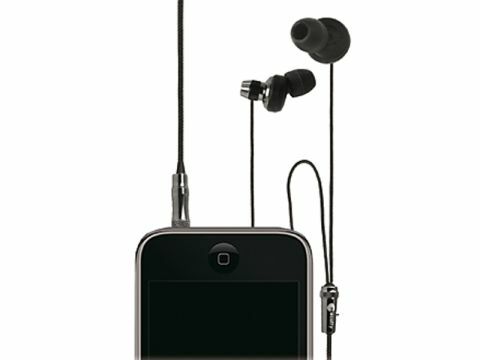 The in-ear cups fit snugly, and isolate a fair amount of ambient noise. However, the earphone housings themselves are ungainly and stick out, but they're very light and the three sizes of cups mean that they can be adjusted to fit all ear sizes. The wires are coated in fabric, which gives them a durable feel, although some of the connections feel a bit flimsy.